Gripsweat - UNRELEASED ACETATE- THE MOVE / JEFF LYNNE 1971 UNITED ARTISTS ACETATE / PSYCH ! UNRELEASED ACETATE- THE MOVE / JEFF LYNNE 1971 UNITED ARTISTS ACETATE / PSYCH ! THIS IS PART OF THE BEST COLLECTION OF PROMOS / DEMOS / ACETATES FROM A RETIRED RECORD COMPANY EXECUTIVE THAT WORKED IN THE MUSIC INDUSTRY FROM THE LATE 1950'S TO THE MID 1970'S, THIS IS ONE OF THE MOST AMAZING COLLECTION OF SINGLES I HAVE EVER SEEN AND I WILL BE LISTING IT OVER THE NEXT FEW MONTHS, THERE ARE MANY NEVER SEEN, OR RARELY SEEN PROG / PSYCH / FREAKBEAT / MOD / BEAT / DANCER / NORTHERN SOUL / ROCK 'N' ROLL / POPCORN / FOLK DEMOS / PROMOS AND ACETATES !!! AND ALL IN AMAZING CONDITION. PLEASE KEEP WATCHING MY AUCTIONS OVER THE NEXT FEW MONTHS AS I HAVE A FEW NEVER SEEN AND RARELY SEEN IN DEMAND ITEMS TO COME UP FOR SALE !!! THANKS. WOW WHAT A FIND !!! This is a RARE UK UNITED ARTISTS MUSIC, UNRELEASED ON A 7” - SINGLE SIDED DEMO ACETATE PRESSING for THE MOVE / JEFF LYNNE from 1971, ORIGINAL UK ACETATE PRESSING IN GREAT CONDITION !!! WOW, this is a REAL FIND, a SINGLE SIDED 1971 UNRELEASED AS A SINGLE STUDIO ACETATE from THE MOVE !!! I am not sure if this is a slightly different mix, although the track ends differently then the one on the album !!! This track was released as the opening track on the band’s 1971 HARVEST RECORDS album of the same name “MESSAGE FROMN THE COUNTRY" !!! THIS WILL PROBABLY BE YOUR ONE AND ONLY CHANCE to get this 1971 UNRELEASED ON A 7” THE MOVE / JEFF LYNNE ACETATE !!! ALL THE ACETATES I AM SELLING CAME FROM THE SAME RECORD COMPANY PERSON AND ARE ALL 100% GUARANTEED ORIGINALS !!! 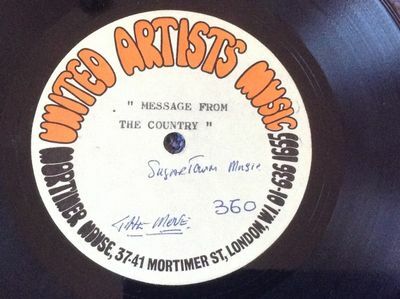 The tracks are: MESSAGE FROM THE COUNTRY / side B is blank. The ACETATE was pressed by the publishing company on UNITED ARTISTS MUSIC ACETATE. The condition of the ACETATE is in VG+++/ EX condition (AMAZING CONDITION for this age acetate, light scuffs and marks only, plays great with only mild crackle as ACETATES tend to have) !! !